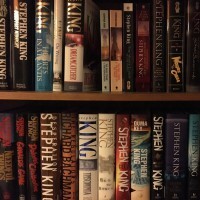 Books in Stephen King’s Dark Tower series. While reading the epic (a project which for me spanned some 16 years), I haven’t consciously tried to imagine exactly how it would end, but of course ideas have floated around in my mind. The greatness of the conclusion to the tale is to me that I didn’t see it coming, but had no problems accepting it. Of course, acceptance isn’t the same thing as complete happiness, and considering the amount of tragedy in the finale it’s hardly King’s goal. But it feels right. Being in no mood to spoil the story, I will keep details at a minimum but I will say that the main boss at Algul Siento, residing over the patient destruction of the ever-important Beams, is a very striking representation of what might be called mundane evil. In fact, evil intent is far from his mind, although he’s perfectly aware of the nature of his job. After the exciting events here (and some equally important preceeding events) things swiftly take a turn for the darker. As in “Wolves of the Calla”, we are also reaquainted with characters from other King stories. If the meta aspects (which are present, however much King hates the term metafiction) felt a bit jarring when first introduced, they feel less so here, and to my great relief they do not “shrink” the story into some witty punchline, as meta elements sometimes do. The increasingly apparent fact that the series is in part an exploration of writing and creativity does not take away from the story. In fact, it’s all a very fitting illustration of King’s recurring claim not to be in complete control of his stories. Those with plenty of time on their hands will discuss the various logical aspects of the complete saga – now that all cards are on the table. I feel no urge to join the online discussions regarding King’s motives for this and that event or scene, a form of second-guessing which to me takes away from the experience. A favourite King line (from “The Mist”) comes to mind: “this is what happened”. For my own part, I’ll just say that on an emotional level “The Dark Tower” is a dark, worthy and satisfying conclusion. Michael Whelan repeats his role as illustrator and has made heart-wrenching art of some of the most poignant moments – the details of which I will leave unmentioned. So, thank-ya, King. This was a tale worth reading. In fact, it’s a tale which makes most other tales seem small in almost every aspect. Susannah and a certain woman named Mia is right in the middle of events in the next-to-last volume. The ka-tet is about to be scattered, and all its smaller constellations will have to work separately to confront the many dangers to the beams, the rose and the universe. This may be seen as a “part-way” book without a clear cut theme of its own – unless one is to focus on the presentation of a new but very familiar character. Still, essential reading of course, and often very entertaining at that. After the typical long wait, but also a near-fatal accident which was to find its way into the rest of the tale along with Mr King himself – the fifth volume finally appeared. The last two were to follow surprisingly quickly, as if King had realized through the accident that his tale might never be finished if he dawdled. Here, the spaghetti western becomes an even more apparent influence, in the shape of events partly echoing “The Magnificent Seven”. The people of a small village on their way to the tower need help, and there Roland’s Ka-tet will also find new paths towards the tower as well as to other wheres and whens. A meta theme which will become a major thread in the remaining books is started here, as we are reaquainted with a certain Father Callahan who once was the priest in a town called Salem’s Lot. Although it tells more of the travels of Roland and ‘the three’, in Mid-World and other worlds, Wizard and Glass is mostly about what happened before, in Roland’s dark youth. Names that have flickered by in brief memories before- such as Cuthbert and Susan – turn into real characters and Roland himself becomes more human, almost understandable. Here King’s other work – mainly the Stand – and the tales of others – from the Wizard of Oz to the Arthurian Legends – come together in a way that’s much more than playful referencing. There’s so much ambition here, and sheer storytelling that IT may yet be overthroned, making me as determined as Roland’s new companions to follow him all the to the dark tower. The hope that it would not be another five years till the next installment proved futile – volume V appeared in 2003. A lesson in the craft of creating worlds. Some of the loose threads from The Gunslinger and The Drawing of the Three come together and a complex and fascinating weave is beginning to take shape. The worlds we travel through are very varied – and there’s also a happy surprise in the book, adding to its appeal. One might say that if you’re not a “tower junkie” after putting this one down, chances are you’ll never be. Metaphysical fantasy at its best, with a cliffhanger ending that cruelly left us readers waiting for the sequel for five years. The gunslinger continues his quest for the vague dark tower, bringing travel companions from other times and worlds. The story takes place as much in our reality as in his strange, desolate world, and sets the stage for things to come in The Waste Lands. The start of the book is surprising, to say the least – not to mention frustrating for the main character. King’s most ambitious work starts out in a manner that almost seems intended to put some readers off. The first book, which introduces The Gunslinger and his mysterious mission, is rather short and offers more questions than answers. Our main character proves capable not only of mass slaughter but of surprising acts of betrayal (if that is the word). Hypnotically strange and very poetic, though. I’ve grown to love this book, but please don’t give up on the series if the start fails to grab you. There’s more to the tower than depressing deserts. The Gunslinger has now also been released in a revised version.